Najar, Brice. 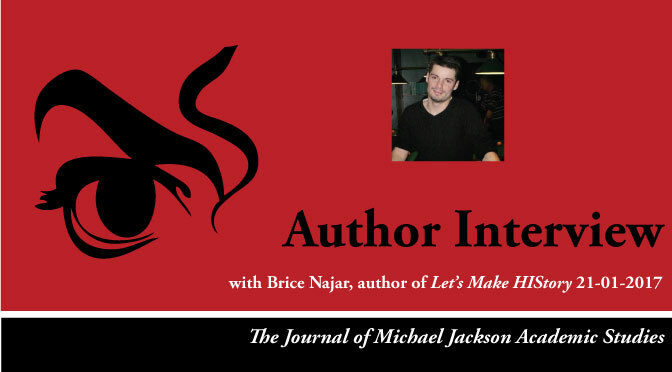 “An Interview with Brice Najar.” Interview, The Journal of Michael Jackson Academic Studies 3, no. 3 (2017). Published electronically 21/01/17. http://michaeljacksonstudies.org/an-interview-with-Brice-Najar/. He has some real influence on my life, on a musical but also human level, so he is very much there. Q2 – Can you tell us a little bit about yourself? My name’s Brice Najar and I am a 37-year-old French author who has written three books about Michael Jackson’s musical world. I have been a fan of the singer since I was 8 years old when I discovered the Bad album, and I have never stopped admiring him. Q3 – When you started writing Let’s Make HIStory, what excited you most about the process? My first two books focused on the songs released as singles and on The Jacksons. In their process, I had to work on my personal feelings. It was quite the opposite on Let’s Make HIStory since its concept was to conduct interviews with Michael’s collaborators in the studio. So it depended on them and their availability, making it a more difficult challenge but even more rewarding when it was finally completed. While I was getting my questions ready I had a thirst of knowledge and I found myself in a discovery phase that the readers would later experience too. I felt like some sort of a spokesman for the fans who admire the King of Pop’s creative process even though I didn’t really know what would come out of that book – both my curiosity and desire for learning were driving forces to pursue that project. Q4 – If you had the chance to meet and talk to Michael Jackson what three questions would you ask him? The first one would be: At the end of your 1993 interview with Oprah Winfrey you asked her if her question about how people saw you was about posterity, but she said ‘no ‘. I think she should have let you dived into that direction. What were your views on that subject? The second one would be: Please, can you sign my Thriller Japanese LP Mastersound? My name’s Brice with an I, not Bryce. The last one would be: Which interview is your favorite in Let’s Make HIStory and why? Q5 – How and why did you decide to become an author? Q6 – Tell us more about your personal fascination with the HIStory album. The HIStory album is closely linked to my High School years since it was during this era that I lived my best memories as a fan – the album promotion through the Black & White French magazine, the videos and live performances broadcasted on TV and of course, the HIStory Tour in Lyon, France on June, 25th 1997. On the artistic level, it seems to me that HIStory is the maturity album for Michael – he was at the height of his art delivering a musical richness through various sonorities going from symphonic to hip-hop, rock and more. This is also his most autobiographical album, and through the way he expressed himself he opened his heart to his audience. The double album concept including a compilation and the notion ‘Past, Present, and Future’ are great too. Those four words were an inspiration to me in order to pay tribute to that piece of work while following both the original pattern and concept that the artist had conceived. This is definitely my favorite MJ album, and if anyone tells me they became aware of it through reading Let’s Make HIStory, that would be the most beautiful compliment. Q7 – This is your third book on Michael Jackson. Are you planning to write further on Michael Jackson or are there other cultural heroes you have your eye on for future publications? When I completed my first book, I never thought I would write another one dealing with a similar topic. I felt the same again when I finished my second book. So in order to dive into such a project once more, I had to feel something new would come out of it. Never say never, you know, but I don’t have another concept in mind for the moment. I am also a Toto fan and someday I should write about that band too. Its musical world is pretty close to MJ’s and that’s why I interviewed Steve Porcaro in Let’s Make HIStory. Q8 – What advice do you have for those wishing to write about Michael Jackson, as you have done? Well, I don’t know if I am legitimate to give any advice to those wishing to write about Michael since I am far from being the only one doing it. Still I think the most important thing is willing to pay him tribute, and a book seems like the ideal channel to achieve that goal. I would also like to quote Thomas Bähler : « If you feel like doing it, then do it ! » That’s what the composer of the song She’s Out Of My Life had advised me when I mentioned I was planning to conduct interviews for Let’s Make HIStory. He was one of the first people I told about the project and I have kept his phrase in mind all along as a beautiful life lesson. Q9 – Do you think there is a place for Michael Jackson in schools and universities, and if yes, what do you think that place is? Q10 – What, if any influence did Michael Jackson have on you? Professionally? Personally? I don’t make a living out of writing – it’s mostly a passion. So I can’t say Michael Jackson has an influence on my professional life. On a more personal level, he was and remains an example due to his obvious charisma. One needs to be very hard-working and determined, and truly talented to make such a career. Also, I have always been very convinced by his messages as a ‘world-aware’ artist. Q11 – What do you think will be the view of Michael Jackson, in say a few hundred years? As an artist, Michael Jackson always sought to break records and his desire to be remembered seemed quite significant. For anyone familiar with his work it is easy to think that he will cross ages just like Mozart before him. He sometimes mentioned his will to be immortal and he achieved it through his art and music. We were very lucky to be his contemporaries. Q12 – Final thoughts: what does it mean to be an author of three books on Michael Jackson at this key time in history, seven years after Jackson’s death? I never really thought about it but now that you ask, I would say that hopefully my works give pleasure to the readers and help them live their passion for the King of Pop. Regarding the 7 years already gone since his passing, I don’t really keep that notion of time in mind. Still, I really hope that the fans’ passion for their idol will carry on and remain strong in the coming years and decades. Thank-you, Brice, for taking the time to talk to us. Brice Najar is the author of ‘Let’s Make HIStory: An insight into the HIStory album’. He is also the author of ‘Michael Jackson: Itinéraire d’un passionné (French Edition)’, and ‘The Jacksons: Musicographie 1976-1989 (French Edition)’ Find out more about Brice here.